Our Public Information Center offers some 500 films, providing a complete introduction to every aspect of Dianetics and Scientology—including the beliefs and practices of the religion and a biographical presentation on the life and legacy of Founder L. Ron Hubbard. 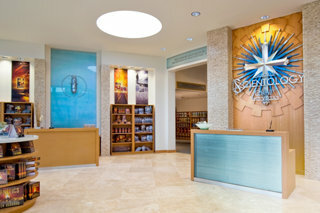 The Information Center also features the many humanitarian and community outreach programs our Church sponsors, including a global network of literacy and learning centers; our worldwide drug rehabilitation and education program; an equally far-ranging human rights initiative; and our Scientology Volunteer Minister program. Visitors are welcome to tour the displays at their leisure for as long as they wish and to return as often as they like. 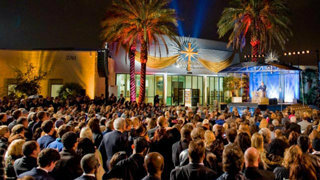 Our Chapel naturally provides for all Scientology congregational ceremonies and services—including Sunday Services, Weddings and Naming Ceremonies. The Chapel also serves as a venue for weekly Church graduations, entertainment industry workshops and seminars by local and national artists, and a host of community performances and events. While our Church serves the entire Las Vegas community, as a Celebrity Centre it also provides a spiritual oasis for its diverse performers and entertainers. Accordingly, our President’s Lounge and adjoining patio are a meeting place for artists, community leaders and guests, whether engaged in Scientology services or merely visiting the Church. Among the many further Introductory Services offered is the Success through Communication Course, which teaches the underlying skill to succeed in both professional and social relationships. There is also an entire array of Life Improvement Courses that help improve any aspect of one’s life, including personal integrity and relationships, marriage and the raising of children, organizing for success and principles of prosperity. L. Ron Hubbard developed the Purification Program to free individuals from the mental and spiritual damage caused by drugs and toxins, through a regimen of exercise, sauna and nutrition—all of which are provided for in our Purification Center. The mural pays homage to Red Rock Canyon and the Nevada desert on which was built an empire of dreams. The Academy is where Scientologists train to become auditors (spiritual counselors), capable of applying the technology of auditing to help others attain spiritual freedom. The Las Vegas Academy comprises multiple course rooms, each devoted to a different aspect of training. Our Café and central courtyard is provided for the convenience of parishioners on breaks from study courses and auditing sessions. Those touring the Church or attending our many scheduled events are naturally also welcome. Welcome to our Church of Scientology and Celebrity Centre. To that end, we look forward to working together with the diverse and creative people of this city dedicated to achieving our mutual dream of a drug-free, crime-free and flourishing culture for all.